Looking back, 'A Nightmare Before Christmas' and 'James and the Giant Peach' represent a remarkable double-shot of painstaking, onerous, yet thoroughly delightful stop motion animated features from Henry Selick/Tim Burton. While the stop motion animation holds up remarkably well compared to the best animation of today, the live action sequences, and in particular the musical numbers, backdate the film to 16 years ago. This time ‘round Selick adapts Roald Dahl’s classic children’s book James and the Giant Peach for the big screen. Dahl’s story features a young boy, James, saddened by the death of his parents in a violent storm, who now lives an oppressed life under the guardianship of his two nasty aunts, Spiker and Sponge. Then a mysterious stranger appears with a solution to his problem - a bag of crocodile tongues, which have the power to make his dreams come true. This comes in the form of a giant peach that grows in his yard, which James uses to sail to New York City and complete the unfulfilled dream of his parents. 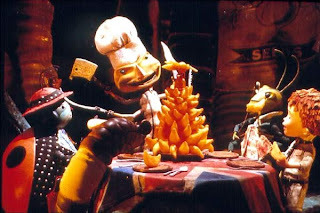 Selick employs both live action and stop motion – live action to show the world of James at home on land and in the real world, and animation once he is inside the peach and on his journey toward the Big Apple – a clever cinematic pun, which may or may not have been intended. The live action world doesn't hold up as well as Selick’s glorious animation process. The opening 20 minutes or so before James enters his peach fantasy world is adequate but not inspired fantasy stuff. Once he is on his journey, the film comes alive. James’ new friends, Old Green Grasshopper, Mr. Centipede, Mr. Earthworm, Miss Spider, Mrs. Ladybug and Glowworm are distinct and quirky characters reminiscent of the skewed townsfolk of Nightmare’s Halloween town - and for fun, Jack Skellington even has a cameo as the captain of a sunken pirate ship. Like Nightmare, the narrative is peppered with a dozen or so musical numbers, most of which are unmemorable, and at least from these cynical adult viewer’s eyes, don’t add much. They may even detract from the enjoyment of the picture. Unfortunately, it dates the film badly, back to the Disney classically animated period of the '90s when everything was animated as a song and dance movie. Now, as evidenced by Selick’s Coraline and most of the CG animated films of today, these sequences of characters digressing into song and dance are a rarity. Selick/Dahl present a number of well constructed and resonate themes which arc throughout the action. After being subjugated by his aunt via the peach, James is allowed to become a leader, accept responsibility and commit his boyhood rite of passage. There’s also a bit of cold revenge in there as well, as the second act climaxes with his confrontation with the evil storm marvellously transformed into the form of a charging rhinoceros. Overall, while Nightmare exploded with action, comedy, music and that dark edge of Tim Burton, James and the Giant Peach is light, fluffy and satisfying but no classic. James and the Giant Peach is available on Blu-ray from Walt Disney Studios Home Entertainment.